The first thing to think about when considering music grades or graded guitar music examinations is really what are they? Then the first decision you will need to make is which one is the right one for you (or for your child)? What kinds of music do you enjoy the most or focus on? What kind(s) of guitar or fretted instruments do you play most? What organization do you think you can identify with the best? In other words…Which one seems to have the appropriate material, character and empathy for your personality and disposition? Where and when are they offered? What about music grades/exam accreditation? Why do Music Grades at all? We could discuss all these questions at length. However the goal here is to collate a concise resource for quick reference to help you navigate the jungle and make your decision(s). There are a few ways you can use this page to help navigate the exam boards jungle. You can read through the following Overview or click on any relevant link above leading directly to the section for each question. You can go directly to the Useful Links PDF for each main examination body found here just below. Each downloadable PDF has direct links to relevant sections of each of the major players' websites. This is a good place to start your own research. If you are in a real hurry because the jacket potato in the microwave is about to ping then just look at (the downloadable PDF) Exam Board Difference Matrix Chart to get an idea of who does what. I have also provided Rough and Ready Reckoner Cost Guide Chart. This is just an aggregate of example fee structures for a handful of exam branches and their cost per level. It will at least give you an idea of what to expect. Generally speaking in most branches of education and employment occupation you will at some point be weighed and measured with some form of scored or judged assessment process. This is no less true for the discipline of music practice and music teaching. There are basically two main avenues for this assessment. One way is the in situ occurrence where the progress is internally verified at the source of delivery, like at school. The other is the third party external verification process, say like a driving test. Who Offers the Examinations for Music Grades? When we are talking about music grades we find it is mostly to do with the largest and most popular independent bodies that solely provide formal assessment of musical ability. This is open to anyone who undertakes the examination/assessment/external verification process they provide. The costs of the graded examinations vary from organisation to organisation. Within each exam board themselves the cost will vary depending on the level entered for the instrument and style branch of the board. For example, the cost to take an electric rock guitar exam could be different from the cost of taking a classical guitar exam of the same level within the same exam board. The amount of difference normally couldn’t really be considered a drastic variation. (see the examples above) It is more important to just make sure you are paying the exact right amount for the exact exam you’re entering for to avoid any inconvenience down the line. When Are Music Grade Exams Held? If you haven’t already you can refer to the Exam Board Matrix Chart above. You will see a three-tiered six-sectioned white and grey highlighted part at the bottom. This shows the conventional “across-board” way of displaying delivery dates and periods. You can see that the exact dates will vary somewhat between boards. They all use a three period system. So there are three opportunities per calendar year to sit an exam. You just have to enter for that period before the closing date for entry to get a place. In most cases you are then contacted with an exact time date and place for your exam. The boards will generally try to arrange a place as near as possible to where you live. They will usually notify you of details when they contact you about the time and date. What About Music Grades Accreditation? Registered institutions that are accredited by UK government regulators validate all the independent exam boards discussed on this main page. 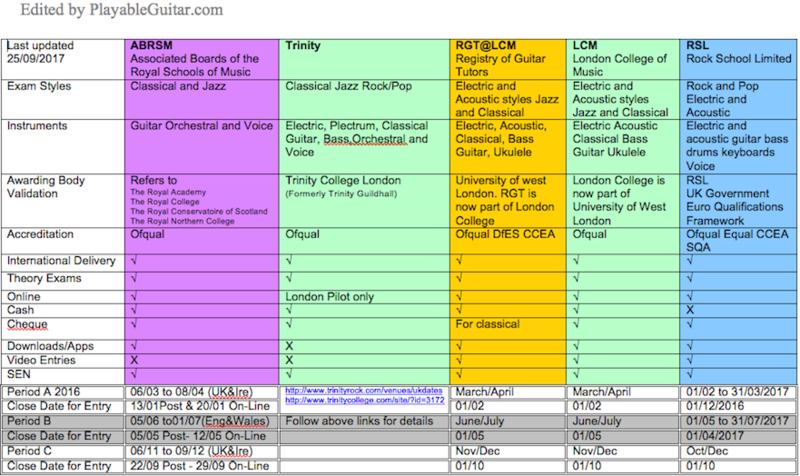 So for example The Registry of Guitar Tutors or RGT is validated by London College of Music. London College of Music is turn part of the University of West London, which is the awarding body. It has corporate recognition from Ofqual (formerly QCA). Ofqual is the UK government’s regulator of exams and tests in England. There are other boards who have high standards and reputations but are not accredited. For now we will stick to most widely known accredited ones. Have a look at this explanation of UK accreditation. This is a PDF from the ABRSM website. It is a very clear and useful document to have in your reach. How Do I Enter a Graded Guitar Exam? Once you have done a bit of self-assessment and research you can make your choice of exam style and exam board organisation. Assuming you’ve done that and are now at or near the comfort zone with the particular exam material and criteria, you just need to get entered. Dive right in to the site of your chosen board and follow any and all instructions. After the first time it gets easier. This is especially true if you make notes and save links to refer back to later. Remember it is likely to be a year or so between exam grades if you are climbing the ladder long-term. Whatever changes in your circumstances you will always have the direct conduit to your own exam grades process.Usually in the form your own account. Use the information and links to short cut your research and enter online where possible or use the information to find your nearest local representative who will guide you through the process for your chosen independent body. Many times all it takes is a bit of advice and guidance to get you into the swing of how your chosen system is administered and delivered. Again this leaves you in control including the historical records, which may carry on for a period of years or perhaps even over many geographic miles. This is by far on the surface the easiest way for the student/parent. Many music teachers, schools and music service providers teach only one specific style or genre but perhaps many instruments. These schools or teacher groups will often align exclusively with one exam body. Teacher/school/group music grades registration works well in this context. The caveats here are that you are not in direct contact with any representative and therefore are no longer in control. It results in a more dependent relationship with the teacher or school. Of course many teachers, schools and music service providers will like things this way. However if for some reason you change teachers (or schools or perhaps genre/style or instrument) you are back at square one to figure it all out again with no real first hand knowledge of the process or even the possibly different favoured board being aligned with. This is really one of the questions you need to ask yourself. In more of the first person context of why do I want to do this? There is really no necessity to take independent music grades like there is a driving test for road users. A driving test is a mandatory independent assessment. You cannot practice driving a vehicle in a real live environment legally without passing it. A note about UCAS (University and Colleges Admission Service).Although higher grades attract UCAS points there is something more important for UK students of this age bracket. The “personal statement” does carry weight with the selection process. The activity and achievement of music grades does display a behavior that carries weight in the personal statement itself. The truth is that music grades are really a cross sectional type of assessment. They only measure a snapshot of some main elements of musical ability. There are many aspects of musicianship that are not fully assessed in this type of exam. Group/ensemble playing, which includes listening reactions, timing, and cooperative dynamics, peer and audience communication and so on is just one good example of a display of an aggregate of skills. Back to the driving test analogy...There is a danger of the “driving test” or “pilots license” effect. Someone may pass a driving test by working very hard to do so over a short period of time. What if they only did well on the day of the test and then didn’t drive again for a year? They’ve never driven at night in the rain when they were worried about a lifestyle, domestic or employment problem. Maybe they’ve never driven on a motorway or over sand or mud. Do you get my point? Getting a good result on a driving test does not automatically make you an excellent driver! Don’t get me wrong though. Music Grades are always good to do. However they are a part of a healthy diet of practical musicianship skills that should include all the other regular intake of musical fruit, fiber and vitamins! Keep an eye out for more exam specific pages, lessons and videos coming soon. Please Subscribe to my RSS feed, News Letter or youtube/vimeo video channels.